Back in May, it was rumored that Samsung was working on several Windows Phone 8 devices that will be the equivalent of the Galaxy S lineup. Even the fact that Samsung had a device hidden (at the time) under the code name “Minuet” was also reported. The biggest part about the rumor earlier this year were some reported specifications, along with the fact that the device may be the Samsung Focus S II Windows Phone. 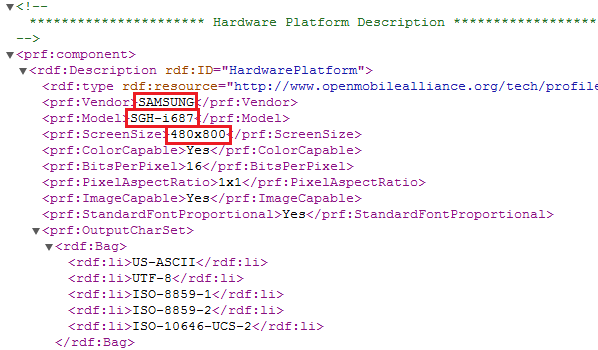 Now, a Samsung Windows Phone 8 device under model number SGH-i687 has shown up on Samsung’s servers. The discovery was made through some user agent profiles on Samsung’s servers. This model number is in sequence with the SGH-i667 model number of the Samsung Focus 2, so this may be the Samsung Focus S II, or just a Samsung Focus 3. For all we know, the SGH-i687 may be a whole new phone all together. The user agent profile linked to the device indicates that the device includes Internet Explorer 10, which will only be available with Windows Phone 8. The display is a WVGA 480×800 resolution, which puts this device as a low-tier to medium-tier device. There are two resolutions much higher than 480×800 that will be supported with Windows Phone 8, assuring the previous statement about this device being low-tier. HSPA+ and LTE connectivity are also evidenced to be supported by the SGH-i687 device. Taking the HSPA+ and LTE connectivity into consideration, expectations point towards AT&T to carry this device later this year. We shall soon see what device the SGH-i687 from Samsung turns out to be later this year.